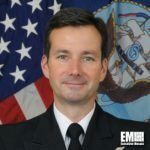 Rear Adm. Christian Becker, program executive officer for C41 and space systems at the Space and Naval Warfare Systems Command, has been chosen to lead the command that oversees procurements of information warfare technologies for the U.S. Navy. 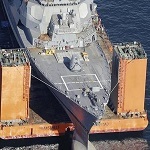 Navy Secretary Ray Mabus and Adm. John Richardson, chief of naval operations, announced Becker’s appointment in a Defense Department release posted Tuesday. Becker has managed SPAWAR’s C4I and space systems programs since July 2013. Prior to his current role, he served as deputy PEO of enterprise information systems at Navy, chief engineer of the Navy’s Integrated Strike Planning and Execution Systems Program Office and commander of SPAWAR’s Space Field Activity. He has also managed a national security space system program for the National Reconnaissance Office. Earlier in his military career, the Navy assigned him the roles of EA-6B electronic counter measures officer and plank-owner of the Joint CREW Composite Squadron 1 that was established as part of the branch’s efforts to integrate electronic warfare into its anti-improvised explosive device operations.